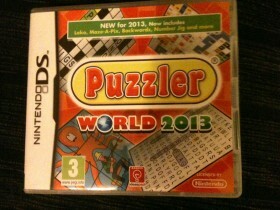 This has been a very different experience for me reviewing a product that you could say I was out of my comfort zone with, Puzzler World 2013 is a Nintendo DS game which is based on the Puzzler magazine. I do like to do a crossword but that is normally in whichever paper I am reading at the time, would I call myself a great gamer well the answer is NO, however I have found this to be quite addictive and will now consider this as a pleasant distraction when on long journeys, such as plane or train travel. Entertainment value was definitely good, the challenges ever changing and the bonus games where truly fun based. I did not find it difficult at all using the DS, the children have been using them for years so I had a general idea what I was doing, and the game is very good at giving you instruction. Our nine year old Kyle, who at the moment is like a sponge with knowledge really loved the games, he found some too hard, but enough choice for him to select those that offered him a challenge without making him feel he had no chance, he also found it addictive and had to be told to put it down as it was bed time. I believe it proved to be educational with regards to spelling for him and at no point did he say he found it boring, it was gaming enough to keep him interested. We both loved the point were you got bonus games and the slot machines came in, it just took it to a different experience. We did not get any where near the end of these games as it is vast, 27 games which equates to over 1200 puzzles, so I believe it will last me a year or more, as for the children in the family, it is the type of game they will pick up and spend an hour or more on and then come back too, truly a sound investment especially for car travel, we shall be taking it on holiday with us. One thing that I liked was the fact I could do a quick puzzle and put it down, so if it was my coffee break I could do a puzzle and then walk away instead of these games that seem to go on forever in which you have to save everything and then comeback to later, I am afraid that is not for me, but puzzler really suited my quick fix needs. As a game I would recommend this for adults, teenagers and children from about 8 years upwards provided you own a Nintendo DS which I think is still as popular as ever. The game retails at £19.99 and worth every penny, just be prepared for family arguments as to who’s turn it is to use it if you only have one game, enjoy. Thank you to Chameleon for inviting us to try the game and provide a review of the game which has not been influenced by any sponsors.